The USS Memphis, a dilapidated submarine that that should have been mothballed decades ago, has been given one last mission by the newly elected president. The task: To sneak illegally into Russia's coastal waters and recon the leaking nuclear fuel containers hidden on the floor of the Arctic Ocean. More than just an environmental nightmare, this radioactive burial ground houses enough nuclear capability to destroy most of America's major cities.The Memphis's commander, Lowell Hardy, had been looking forward to flag rank and pleasant duty upon the sub's decommissioning. Now he is trapped in an inconceivably dangerous and illegal mission which could easily end his career, if not his life and the lives of his crew. 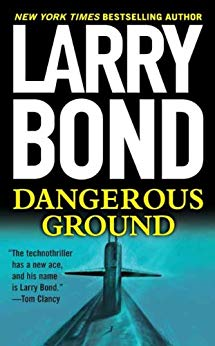 But it's the crew who feel Hardy's tension as he tyrannizes everyone on board to ensure they'll be ready for anything:Jerry Mitchell: a former naval pilot with political connections, he is a novice submariner, unprepared for his demanding job as a weapons officer. Central to the Memphis's mission, Mitchell may be its greatest liability . . . or its ultimate salvation.Dr. Joanna Patterson: The senior civilian scientist, appointed by and reporting to the president, she is a world-class expert on nuclear fuel contamination--and every bit as demanding as Hardy. Patterson and her partner, Dr. Emily Davis, soon find themselves battling flaring tempers, faulty machinery, lethal radioactivity, and the raging arctic seas.The submariners: Seething with rage at their Captain Bligh-like commander and the equally domineering Joanna Patterson, they are also at war with Jerry Mitchell, and one another. Like the captain, they feel they deserve better, not this antiquated relic, not this hostile scientist, not this novice weapons officer, and definitely not this disastrously dangerous mission.Nor is the mission what it seems. Lurking beneath the frigid, black, radioactive waters is a secret far more deadly than anything naval command could imagine--a secret so menacing the Russian Fleet is hell-bent on destroying the Memphis and all who sail in her.At the Publisher's request, this title is being sold without Digital Rights Management Software (DRM) applied.